Not washing and storing eggs with the rounded end up will prolong their shelf-life. Why? How? The answers are simpler than you may expect. Why not washing eggs is good for them….. 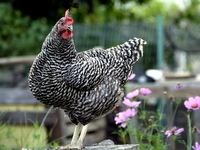 When the chicken lays the egg it is coated with a substance called “bloom” which seals the shell. The shell is porous and washing it removes this protective coating which permits bacteria to enter into the egg. gently spot clean with a moistened cloth. The cycle of an egg is quite amazing. It begins as a yolk, one of many, which are stored deep inside the hen. During each 24 hour period the yolk travels from the ovary developing the white and finally the shell before being expelled through the vent. Just before it is laid, it is coated with the bloom. Inside the eggshell there is a small pocket of air which is for the chick. Over time, since the shell is porous, more air enters into the egg. The bloom slows this process. When the egg is stored pointed side down, the air pocket is located at the top rounded end between the inner and outer shell membranes. then This pocket gradually grows over time as the egg loses moisture. Keeping the air pocket at the top helps to prevent it from rupturing and reduces the risk of spoilage. It also helps to keep the yolk centered in the white. Author KathleenPosted on January 2, 2018 3 Comments on So happy to say good-bye to 2017! Welcome 2018! Author KathleenPosted on December 31, 2017 2 Comments on Happy New Year! Another year has passed and we are celebrating our first Christmas in our new home, and looking forward to celebrating many more here. Wishing you all a Merry Christmas and best wishes for the coming New Year. We knew this day would come, just didn’t expect it to come so quickly! As I mentioned earlier I had decided it was best for me to find a new home for my goat herd since I am no longer able to care for them. It took only a few hours following a notice I placed on a Facebook Goat group page to have a new home arranged for them. This morning their new owner arrived at the farm to meet them and take them to their new home in NC. A lovely young couple are adding the herd to their new homestead, where I feel certain they will thrive. Another new beginning for all of us. It is hard to believe we are already in December! Where has the year gone? Stress-filled for sure, but things are finally looking up….somewhat. Let’s begin with an update on the waste-water situation. From what we’ve been hearing around the area, the waste-water/septic issue has also been rearing its ugly head to those who had previously been “grandfathered” in with their ancient systems and emptying their laundry water out onto the ground are no longer saved from these environmental laws. They also must go through the evaluation/inspection/design and most of all, the expense of replacing their old systems and meeting the new codes. Many of these folks are hardworking, blue-collar people who do not have the means to go through the process without re-mortgaging their homes. We finally reached the conclusion that by the time we completed the process to get an approved system we would have spent half the money we had saved up to restore the farmhouse. By chance, while we were exploring the nearby town, we came across a new on the market, estate sale home. In a good neighborhood, with an acre of land, and a once elegant home we decided buying it was our best option. We were able to purchase this home with the funds we had saved up to restore the farmhouse so, no mortgage and ready to live in. Being an estate sale there are of course repairs and updating to do, but they are few. The farm is only a few miles away and we go there every day to tend to the animals and do chores. Our farm life hasn’t turned out the way we had dreamed, but it isn’t all bad either. find an egg. The new flock consists of Star Spangled Hamburgs, Aracanas and Black Astralorps. Four hens and one rooster of each breed in the hopes of increasing the flock. We also raised a dozen meat chickens. This year we tried raising Red Rangers and they are wonderful! We are never going back to the Cornish X. The RR are big, beautiful and friendly chickens. They are great foragers and taste great. There was no garden at the farm this year, sadly. Even the raised garden I attempted did not work out. I believe our luck will improve next season as our land in town is better for growing a garden…. there is even a section where I may be able to plant a small orchard. My long dreamed hope to raise goats for milk is coming to an end. Since breaking my ankle last year I have been having a difficult time tending to the goats. After trying all these months to “make it work” I have come to the painful realization that my sweet things would be better off on a farm where they can receive the proper attention. So it breaks my heart, but I am re-homing my herd as soon as I can find a suitable home for them. Well, this has been what has happened since my last posting. Not good, but not all bad either. Through the next few months I will be re-thinking our situation and the farm, and develop a new plan for going forward with our homestead dream. As I’ve advised so many people who have asked how can they homestead: Homesteading isn’t a matter of where you live, but, rather, how you live. We still have our farm, and will continue our “Simple Life” homesteading lifestyle. After all evolving means changing and adapting and we are getting pretty adept at it. Until next time….. thanks for visiting.